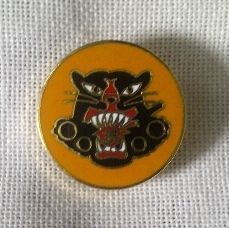 I have so appreciated the opportunity to view your website on The 643rd Tank Destroyer Bn. My name is Jim Foster, and I am the eldest son of Jim and Dorothy Foster of Harrington Park, NJ. Unfortunately, my Dad passed away little over a year ago, on 12 July, 2008. He was 87. My Mom, is 85, and is still living in Harrington Park. I am 63, and living in Edina, MN with my wife of 33 years, Sarah. He never talked much about the War, and it really wasn't until his later years until he would share some stories and history with us if prodded. I believe this is pretty normal for most who have been in combat. In reading Bernie Haas' story, I see that he and my Dad were in the same Company. I am wondering if he is still alive, and whether you know how I might contact him. I am planning a trip to Europe this winter or spring, specifically to visit the places and areas where he served. I have been over there many times on business, and I think, even in some of the Belgian and German towns where he was, but never knew it, until I had a chance to view the histories you have put together. I also made some notes from conversations with my Dad, and they seem to parallel some of the same memories from Haas about which units they were attached to, and so forth. One story he told was about when they were attached to the 82nd. He said they were a top notch outfit! 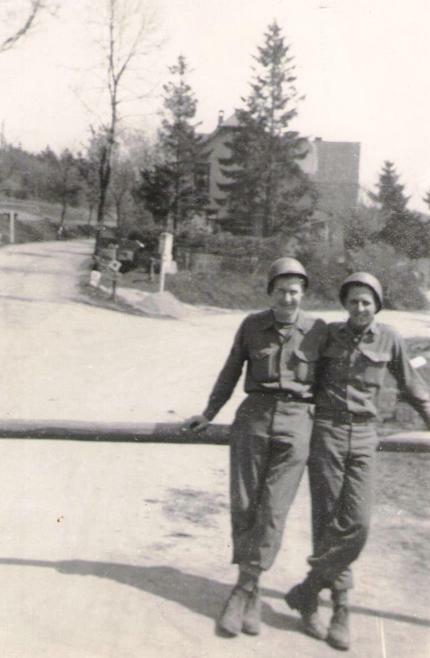 My Dad didn't say where or when, but only that recalls it was very cold and wet, and they were seeing combat. He said they were dug in somewhere, when up pulls a jeep and this general jumps out and comes up to my Dad. He asks, " Sergeant, when was the last time your men had a hot meal?" My Dad says, "Quite a while ago, sir." Then the General asks, "When was the last time your men had dry socks, and boots?" Again, my Dad says "Not for some time, sir." He said the general then turned to his aide and said," I want these men to receive hot chow and a resupply of socks and boots by tonight." The general jumps back in his jeep and leaves, and sure enough, a few hours later trucks arrive on the front lines with hot food and dry socks and boots. My Dad remembers that that was the only time during the War that he ever saw an officer above company grade on the front lines. It was General James (Jumpin' Jim) Gavin, the 82nd's Commanding General, and a man my Dad and many others admired both during the war and for many years afterwards a real soldier's soldier. If there is any further information you might have, or can direct me to anyone who might have knowledge of Co. B I would certainly appreciate it. I will also try and gather photographs that my Mom has, and pass them along. 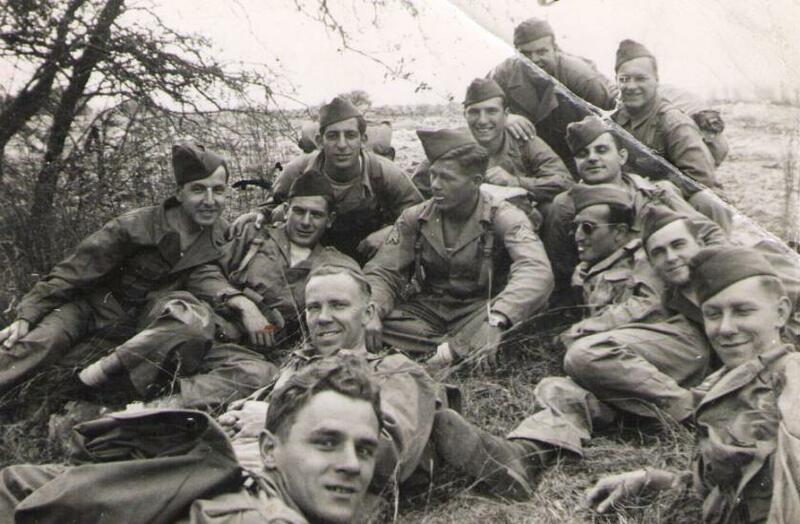 Thanks for helping to honor these men who served and were indeed part of The Greatest Generation! From left to right, Vincent Giannone, Carl Forlenza, Bert Druckman, ”Curly” Katyla, Jim De Palma, Charlie Piombino, Jim Foster and Melvin Muszynski. Bill Carmel and James. Picture taken somewhere in Germany. With the group of guys . 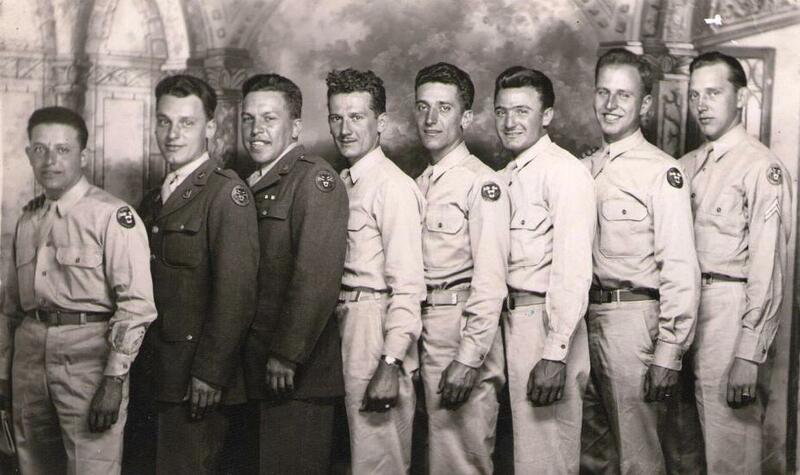 Sorry, but I don’t have any names, although some of the faces look like some of the guys in the group shot from 1944. E-mails from Jim: I also have contact information for the two people in the Army Reserve located at Ft. Snelling, in Bloomington, Minnesota who gave me the flag. The person whom I initially spoke with and who offered the flag, and her thanks for what you and others are doing was SSgt. Alexandra Miller. The person who gave the flag to me was Michael Begley. I am writing to thank you both, and The United States Army, for giving me the flag on April 15th. My wife, Sarah, son, James and I were able to present it to Ben Savelkoul on Saturday the 18th. 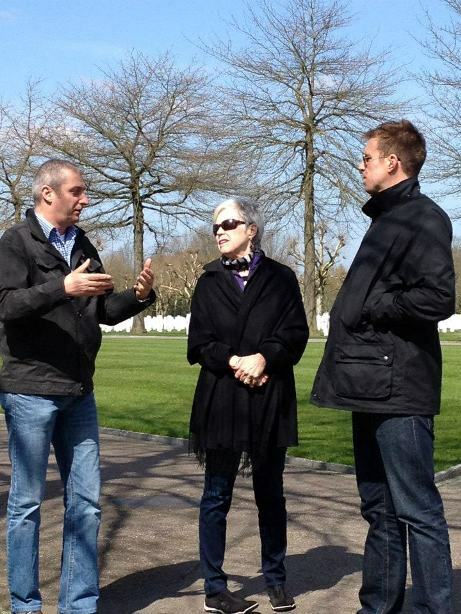 He is the Dutch citizen who has adopted numerous graves of fallen American servicemen and who are buried at The American Military Cemeteries in Margraten, Holland, and in Henri- Chapelle, Belgium. 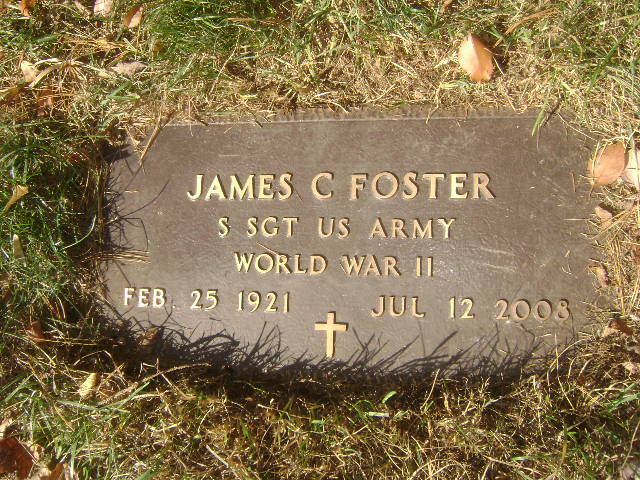 As I may have told you, my Dad, James C. Foster served as a SSgt with the 643rd Tank Destroyer Battalion during WWII. He fought in The Ardennes, The Rhineland, and Central Europe Campaigns, and was wounded and received a purple heart during The Battle of The Bulge. Ben is a military history buff, and a number of years ago, he researched the 643rd, as it was the unit of Sgt Michael De Febio, one of Ben’s “adopted” soldiers who was killed in Germany on April 12th, 1945, less than a month from the end of the war in Europe. He developed a website on that unit, which is how I came to know of him, and learn about the local citizens who have adopted our fallen comrades in arms. I presented the colors to him on behalf of the men of the 643rd TD Bn. and their families; The United States Army, and its members at The USAR at Ft. Snelling, MN; and from all Americans who appreciate the honor and respect he and others have shown our war dead . Ben took us to The Cemetery and Memorial at Margraten . 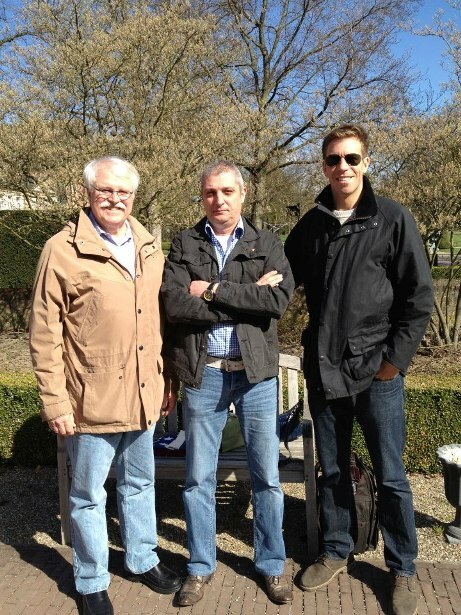 The next day, we drove a short distance to Belgium, where we also visited Henri-Chapelle Cemetery. There are about 8,000 American dead buried in each Cemetery. At Margraten, there is a waiting list of Dutch citizens who want to adopt graves. It was quite stunning and moving, and our great privilege to honor the WWII fallen for their sacrifices.